I can't even tell you the last time I had a sloppy joe but Matt suggested them as a good use for the ground beef & buns we had leftover from camp this past weekend. I had forgotten how tasty they can be. 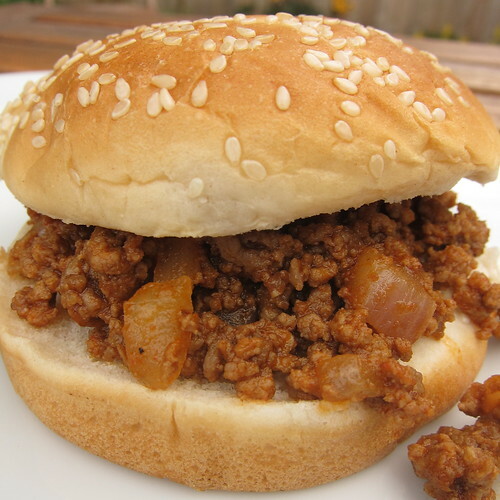 Growing up sloppy joes were always made with a packet of seasoning picked up in the soup aisle of the grocery store. As I've gotten older & started to care a little more about what I eat, I look at those seasoning packets & am shocked by the amount of salt in them. Matt couldn't believe I'd think of buying them anyway since he knew he could create just as good a seasoning mix with what we had in the spice drawer. Of course, he was right & these were some of the tastiest sloppy joes I can remember having. The mix of the pepper & brown sugar gives them a sweet & spicy flavor that is just right. Heat the olive oil over medium-high heat in a large skillet. Add the onion & cook until starting to soften. Add the beef & cook until cooked through. Stir in the pepper, ancho, paprika, garlic, cayenne & brown sugar until well blended. Stir in the tomato paste, mustard & water. Bring to a simmer. Cook well stirring from time to time until thickened, 5 - 10 minutes at the most. Taste & add salt as needed. 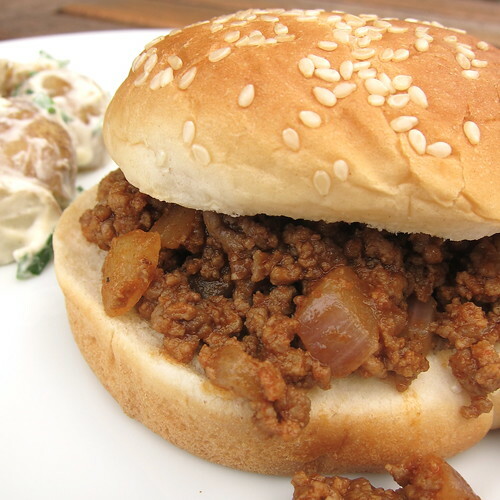 When was the last time you had a sloppy joe? I *love* sloppy joes and like you, was shocked at the crud that goes into the mixes for them. It's all so unnecessary for a great sloppy joe! Most people have everything they need right at home. So good! I haven't had a sloppy joe since summer camp. Never been a fan of them, but maybe with high quality meat they'd be tasty. I like that your Sloppy Joe isn't too sloppy...saucy but not runny. It's been ages since I last had a Sloppy Joe! More often, it goes straight in hamburger patty mode. But now I recall what I've been missing! And you're right - why go the salt and preservative-laden packaged mix when we probably have all the wonderful ingredients at home? Recently we've started adding diced green peppers along with the onion and garlic. That adds a nice dimension. Also, I can't eat beef for awhile because it effects the baby, so just last week, we switched to ground turkey and with all the spices and flavors that are in sloppy joes it turned out good. We love sloppy joes. I also make the seasoning mix from scratch, adding dried green pepper from what I dehydrate. My kids love them like I did. We even served them at my daughter's graduation party. Oh, and we do them with turkey instead of beef. My wife had one too many bad sloppy joes as a kid, but i'm quite fond of them. I haven't had a GOOD sloppy joe in ages. Thanks for posting this, I'm trying it and soon. I don't think I've ever had sloppy joes before...? My husband will surely make that face that's all OH MY GOD YOU'VE NEVER HAD THAT BEFORE like I had a depraved childhood or something. I think he's made that face at me before when I confessed to never having seen Goodfellas and never having been to a Baskin Robbins before. When my mom made sloppy joes for the first time when I was a kid, I was firmly convinced that she had made up the name to mess with us. After I ate one, I don't remember caring as much, haha! Oh, wow, I can't even remember the last time. I do remember that my mom's version was much better than the school cafeteria though! I sometimes make bbq beef for sandwiches which is similar to the SJ, but without the seasonings. I need to try making the real thing now. I do love Sloppy Joes. I make them with ground turkey and use lots of minced vegetables like two kinds of peppers, zucchini, onion, sometimes shredded carrot. I add corn and black beans and they are so, so good. The Teen doesn't even know that he's devouring all sorts of good things. i haven't had a sloppy joe (read: "Manwich") in what has to be more than 35 years! i used to love them as a kid though. i am with Pete...like the not-so-sloppy part. that ingredient list is like 2/3 of my barbecue sauce ingredient list! Oh my God you are so right, I can't remember either the last time we had sloppy joe's and we just love them. The sloppier the better, oh how yummy, making my mouth water just thinking about them. Thanks for a great dinner idea. I can't remember the last time I had a sloppy joe! I tried making them myself once but the seasonings were off. I'll try your version next time. I have been having a craving. I bet yours beat out those packaged ones hands down! I love sloppy joes and don't make them often enough. I don't use a seasoning packet, but I do put chopped peppers, celery and pickles in with the spices, ketchup, mustard and brown sugar. Sloppy joes are always a favorite! This spice mixture sounds fantastic. I've never had a sloppy joe! When I was little, we had an old Betty Crocker cookbook, which I considered the height of exotic Americana. I'd never even heard of macaroni cheese with sliced frankfurters in it... The recipe for sloppy joes was something else that fascinated me. These, unlike those, look like actual food!